Kaslo Curling Club AGM this Wednesday at 7 pm at the club. Dean, Kellie, Dan, and Lana admire the WWND Cup. Congratulations to the Knoll team for closing out the season by winning the coveted WWND Cup! 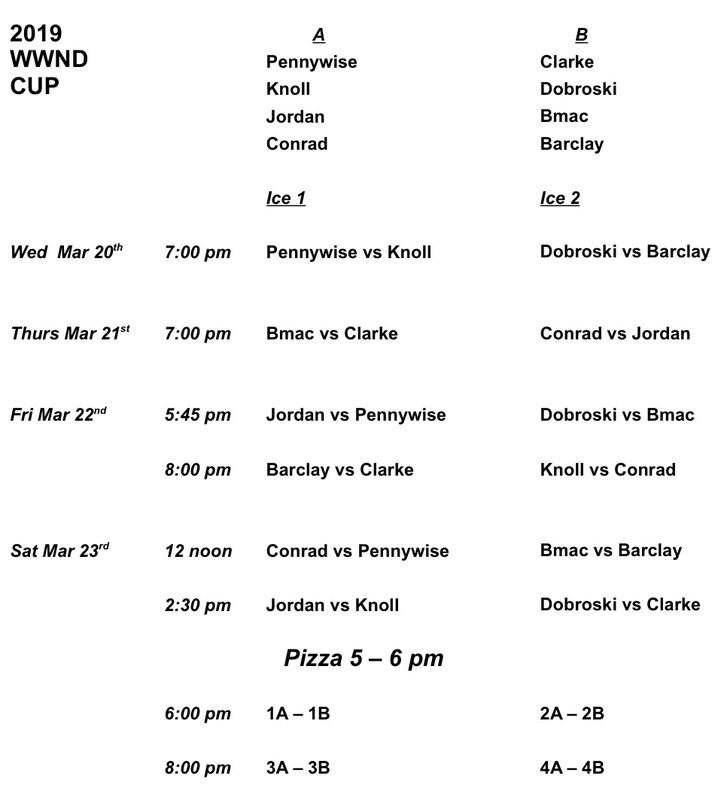 The WWND Cup is running this week and spectators are welcome to come up and watch our final games of the season. (Update 2019-03-20: The schedule has been changed to swap the Knoll and Dobroski teams). Members are also invited to come up for free pizza and snacks on Saturday, March 23rd from 5 – 6 pm, and to watch the WWND final rounds starting at 6 pm. Feel free to bring your favourite finger food. It’s time to work off all that good Christmas food! Thursday/Friday League starts Thursday, Jan 3 and the schedule is here. Normal scoring is in effect. Next equipment order deadline is Friday, January 11 (last one of the season). The 5-rock Free Guard Zone (FGZ) is now in effect, replacing the 4-rock FGZ. Opponent guards cannot be removed from play until the 6th rock of the end (formerly the 5th rock). The Kaslo Open Bonspiel (Jan 25-27) is FULL and we’re welcoming 9 out of town teams this year. The entry list is here. Email kaslocurling@gmail.com if you want to be added to the spares list. Karma, John and Rita celebrate the tie! Congratulations to the Pennywise team for winning their first point!!!! Apparently the secret was to wear party hats. The other team wore kilts, so who knows what actually happened over there. But it’s great to see their hard work and enthusiasm start to pay off. Congratulations to Kaslo Curling Club members Al Barclay, Rosanne Benko, Colin Jacobs, and Laureen Jacobs (along with Colin’s brother and sister-in-law from Nelson) who had a successful outing at the Doug Bothamley Memorial Open Cash Spiel in Nelson this past weekend. They finished 3-2, tied for 7th out of 20 teams, and won $750. Good curling!!! Our Kaslo Open Bonspiel is Jan 25 – 27, 2019. We put up the poster less than 2 weeks ago and we already have 15 of a maximum 16 teams registered, with 8 from out of town. Email kaslocurling@gmail.com to enter a team or enter as a single and we’ll see what we can do. Some of the local skips have reserved a spot but don’t have full teams yet, so you can also contact one of those skips if you want to sign on with them. The next equipment order deadline is this Friday, Dec 7. Write your order on the form downstairs, or email kaslocurling@gmail.com. Pennywise came SO CLOSE to winning last week. Keep it up, we’re rooting for you! Dec 4 is the last Tuesday night practice session for 2018. We’ll let you know when they start up again in the new year. AGM will be Wednesday, April 17 at 7 pm at the Kaslo Curling Club.